One Garden may not be the first garden building retailer that spring to mind when you are looking for a shed, summerhouse or some other kind of building for your back garden. But they are getting bigger and bigger and in the world of garden sheds, they do look like they could becoming a major player in the world of garden buildings. That is why us folks at WhatShed have decided to give them a really good look over and see how good their site is, what kind of products they offer and even see what real customers have had to say about their dealings with One Garden. Great if you want something large like a garden office or even gym! One Garden actually has a very interesting background in that in 1997 a group of people who had experience in the world of garden buildings got together and started the company. Their team has a lot of knowledge in the field of garden buildings and their aim is to pass that onto their customers. The first thing we decided to look at in our One Garden review was the kind of products that they offered. Any garden building retailer is only as good as their selection and we can tell you that One Garden has a lot to look at. They have sheds made of wood, metal, and plastic which was nice to see and their selection of sheds, in general, is pretty vast. 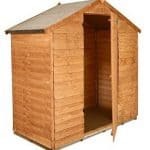 We would go as far to say that no matter what kind or size of shed you are looking for, you will find it here. 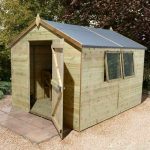 They have a large selection of other types of garden buildings like summerhouse, but as well as this more high end things like log cabins and larger garden buildings are also on sale here. One of the things that really caught our attention at One Garden is their Arbours and Furniture section. They seem to really specialise in arbours, garden seats and other things that give you a place to sit and relax in your garden. We are actually having a hard time thinking of another retailer who showcases arbours, pergolas and other garden “accessories” in this kind of way. When looking at their sheds, we liked the different styles they had. You can easily get a basic 8 x 6 wooden shed here like their overlap no window 8 X 6 shed for example. For the average person just looking for a basic shed this kind of thing is great. 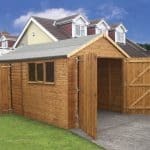 But at the same time, they also have far larger, more elaborate and higher quality sheds as well. So if you are a person who knows exactly what they are looking for, chances are you are going to find it here. One other thing we have to mention is accessories. We are talking here about things like lawn edging, decking tiles, and paving kits. Things that are going to finish off your garden perfectly. One Garden has a very impressive selection of items like this. So you can really get everything you need here to totally redesign your garden. Also, we want to mention that they carry products from a variety of the bigger brands in the world of garden buildings such as Rowlinson and Shire, that was nice to see. Plus most of the products we looked at had a 2-7 days delivery time, with the longest one we saw being 21 days and this was for a large garage. One Garden as you would expect with the huge amount of products they have sheds, greenhouses, summerhouses and other such garden buildings at all areas on the pricing spectrum. They do have some sheds for under £200, but we get the impression that the cheap and cheerful style of shed is not their main focus here. Do not get us wrong there are some great bargains to be had here and their sale section was actually pretty awesome. But we are not sure that those of you who are on a super strict budget would be using these guys as your first stop on your journey for a new shed. We feel a little harsh saying this as like we said there are some fantastic deals on here. For example one of the first things we saw (as of writing this review) was a fantastic and high quality Shire Pressure Treated Overlap Shed 10×7 with Double Doors for under £400 which in all honesty is not a bad price at all. The problem we had was that you really had to work the search engine and dig through the items in each of the categories to find the best and cheapest deals. One thing we have to give One Garden a big thumbs up for is their higher end products. Now, of course, they have some incredible sheds and greenhouses. But what really blew us away was their log cabins. Some of these are truly incredibly like the Millbrook Studio 19mm Log Cabin 2.6 x 3.3m which they have for just over a grand and it looks amazing, not only this, but it is large enough to use as a spare room! We feel that their higher end items and larger garden buildings are actually very well priced and certainly in contention with what other retailers are offering. If you are looking for that large summerhouse or a building that you could use as an office, then we would certainly say having a look at what One Garden have is well worth it as the prices are very good. One of the things that we know you will be interested in with our One Garden review is using the site. We have seen some sites that make finding things pretty hard and that is not really the case with the design of the One Garden site. Along the top of the page, they have different tabs for things like garden buildings, landscaping, arbours, garden tools and so on. There are eight tabs in total and each one you click or hover over will give you more options. Garden Buildings, for example, has 14 further options for you to pick from. They have sheds, summerhouses, log cabins, garages and general storage all in here. We get that keeping it all in one place helps keep the home page tidy, but we do feel that some of these like sheds and summerhouses could have maybe used their own tab. As you scroll down the page, you are just bombarded with stuff. We are talking different products, more search options, and various deals as well. 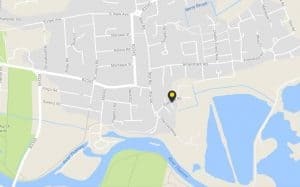 Some people may find it a little daunting, but we feel that they have done a pretty good job in showcasing just how much stuff they have for sale on their homepage. It certainly does make you want to take your time as you scroll down it. So what about when you find something that you like? 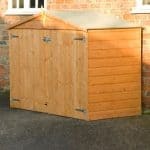 When you click on an item, let’s take their Rowlinson Oxford Shed 4×3 with Lean-to for example. We have to say that One Garden do a fantastic job in letting you know what you are getting. They give you the highlights of the product at first and then as you scroll down, you get into the nitty gritty of the exact details. They even have a bit of a jargon buster on the side of the page which explains to the customer what things like OSB boarding and tongue and groove cladding is. We feel that a person who knows nothing about sheds would be able to click on a product and then have all the information they need to make a knowledgeable decision about buying it. They also are not shy with the camera and most of the products we clicked on had multiple photos showcasing the sheds, summerhouse and other things from numerous angles. One other thing that we have to mention is that they do actually have a live chat. This is really good as it means if you do have any questions rather than having to call them and waste your mobile minutes or wait for an email response. You can talk to a virtual agent and get your questions answered much quicker. This is a really cool feature and one we wish more garden building retailers would use. One Garden do allow customer reviews and they do it in a very interesting and sensible way. All of the reviews that you see on their site are genuine and to be honest with you, we do kind of take them at their word here. They only post reviews from people who have actually bought the item they are reviewing. If you bought a shed, for example, you would be sent an email asking if you want to write a review and then they would post it. This is how they go about having reviews on their site. We think this is a great idea as it stops just random people being able to go on and write bogus reviews on a product. But at the same time, it does mean that there is not a ton of reviews on here. This is most likely because of the manpower involved in getting a review posted to the site. An email has to be sent, the review is written, the review is checked and then it is posted. So there may not be a ton of reviews on here, but we do not think there is anything sinister in that, it is just the way they go about getting reviews that prevent there being loads of them. Once you click on a product, near the middle of the description is a section that says reviews. You can tell if the product has any reviews as there is a star rating there. From what we could see there is no way to organise products in terms of their popularity and you do not know if a product has any reviews until you click on it. The good news is that a couple of the products we looked at had 2 and 3 star reviews. This shows that the people at One Garden are not just posting positive reviews which is nice to see. It makes us feel that they are quite a trustworthy and honest retailer. One thing we also have to mention is that they do have a dedicated review section. This is close to the top of the home page and on here you can click to see a larger selection of their reviews. Here you can see what the top reviewed items are. It may not be the way other sites do things, but we must admit that we really do like the way One Garden handle their customer reviews. What Are The People Saying About One Garden? While we have spent a lot of time looking around the One Garden website, making sure to check as many products as we can. We also want to share with you guys what we have found online in regards to actual customer reviews. Now there are reviews on the actual One Garden site, but here we are talking about customer reviews that are left on other sites. This is usually a very good way to get a more unbiased opinion of how a transaction went down. From how good the product was to the customer service that was given. So where we are looking at some of the online reviews about One Garden that we have found. One thing that we want to stress about reading customer reviews online is that most of the time people are more willing to take the time to write a review when something goes wrong! We are not saying this as a way to excuse One Garden or any other garden building retailer from anything. But we do feel it is always important to remember that people are willing to talk more about a bad retail experience than a good one. Ok now with what we have just said, this is a little bit embarrassing. You see, we could not find one single review for One Garden… like seriously, not one single review that was not on their own site! Now some of you may say that this does raise a load of red flags, but we do not think that is the case. Sites such as Trust Pilot do actually have a section that is dedicated to One Garden, but no one has yet left any reviews. Rather than taking this as a negative (although it is a little weird) we would take this as a positive as if someone had a negative experience then you could bet the last pound you have down the back of the couch that they would have posted it here and at least Trust Pilot have acknowledged that they exist. The only things that we could find while we were doing our Inspector Gadget style sleuthing were that there is an official One Garden Twitter account and an official One Garden Pinterest account. These though do not have anything from any customers on them and instead focus on products, special offers and in general just them having a way to communicate with potential customers. Seeing that they do have a social media presence is a good thing. But we do kind of feel that a Facebook account should be something they consider adding as that is an easy way for people to talk to them in a public setting. 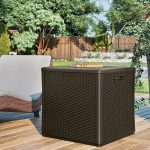 We have spent a lot of time on the One Garden website and we want to be as fair as we can in our One Garden review. That is why we want to talk about things that did make us say “hmm”. Thankfully there was not actually much at all. We liked the design of the website and feel that they have a nice amount of customer reviews on their site and even some less than great reviews, so it seems like they are fair when it comes to letting customers place reviews on their site. But in talking about reviews, not being able to find a single one for this company anywhere online was a little weird. But to give them the benefit of the doubt they are not as large a company as say a B&Q or a Garden Buildings Direct so that is most likely the case here. So as of right now, we would have to say that we do not actually have any major concerns with One Garden, even with the lack of reviews for them floating around online. No online retailer is perfect and as good as we feel One Garden are there are some things that we do think that they could do to make their site and company even better. First thing is to have a Facebook account! This is the biggest social media app on the planet and more eyes will see this (and be able to comment on it) than Twitter. We would also like to see them tone down the amount of things they have on their homepage. Do not get us wrong, we loved the busy and jam packed with deals homepage. But for a person just looking for a simple and affordable shed. It may seem a little daunting, but to be fair to them this is a very small and minor issue. When we decided that we were going to conduct a One Garden review, we really were not sure of what to expect. But thankfully we are very surprised at the vast amount of products that they offer. They have a great selection of name brand sheds and garden buildings here and in general, we are very impressed with the selection that we saw. It is not just the garden buildings, but the accessories like tools, fencing, stones, decking and everything else a person needs to bring a garden to life. You can pretty much kit out your whole garden here and that is great. We do feel that they need to up their social media game a little bit and maybe when they are sending out emails asking people to review their products on their own site. They could perhaps try and get some of these same people to write a review on Trust Pilot or one of the other recognised review sites. As we have said a few times in our One Garden review, there are no online reviews for them. So if you have purchased a shed, summerhouse or even one of their huge garages. Let us know in the comments below what your experience was like as we are genuinely interested to know more about these guys as they seem like they are doing a great job. 1-2 weeks. Very poor customer services.